Associate athletics director for sports medicine Jeff Allen is in his 12th season at The University of Alabama. Before joining the Crimson Tide, Allen was the head athletic trainer at the University of Central Florida. At UCF, Allen was responsible for all of the sports medicine needs for the entire department. One of the most respected athletic trainers in the country, Allen was named the 2017 Head Athletic Trainer of the Year by the National Athletic Trainers Association. He has authored several published articles and is a regular speaker at national and state athletic training conferences. He had work published by The Journal of Athletic Training and Athletic Therapy Today. 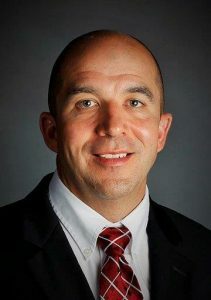 Allen has served as a featured speaker at conferences held by the National Athletic Trainers Association and the Southeast Athletic Trainers Association, as well as state meetings in Georgia, Kentucky and Tennessee. Prior to his post at UCF, Allen was head athletic trainer at Chattanooga from 2000-04, overseeing the athletic training operations for 16 varsity sports while handling all of the duties associated with the football program. Allen was an assistant athletic trainer at the University of Kentucky from 1997-2000 and earlier served as an assistant athletic trainer from 1995-97 at Valdosta (Ga.) State, where he was head athletic trainer for the football and baseball teams. He earned his master’s degree in health and physical education from Valdosta State University in 1995, while also serving as a graduate assistant for two years. A 1993 graduate of Georgia Southern University with a bachelor’s degree in health and physical education, Allen and his wife Mary have one daughter, Makennah.